I cant see through the weeds cause they're taller than me. Blinded by the thick I hope there ain't no one on the other side that's my enemy. On this path im on not even god can see where im headed. So blind I can only hope its not in the ground then up to heaven. But There's only so much I can control so I don't know why im stressin. These days my friends are dwindling so all that gets me through is the music so it must be heaven sent. I may stumble along the way but the hour to worry about that is the eleventh. 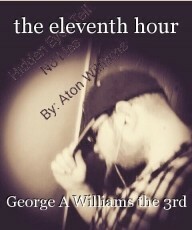 © Copyright 2019 George A Williams the 3rd. All rights reserved.